It’s 30 years to the month since I first read It, Stephen King’s 1100 page epic about a bunch of kids terrorised by an evil force. Though overlong, and filled with some unnecessary scenes that outstay their welcome, the core of the story was compelling. King took his time breathing life into his eclectic characters, and due to the length of the book, I didn’t so much read it as inhabit that world. Decades after Tim Curry’s superb turn as the evil clown Pennyswise in a pretty good TV movie, we finally have the big screen version. I’d expected a disaster, especially seen a few weeks after the car crash that was The Dark Tower adaptation. So it’s a relief to report that not only is It (2017) one of the best King adaptations so far, it’s also one of the best horror films of the year. Reading the novel in 1987, I didn’t empathise much with the young character who introduces us to the demonic Pennywise, but age changes a lot. 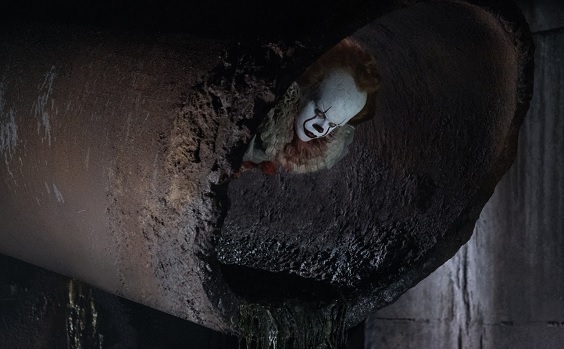 I will him not to go near that storm drain, and to just carry on running and live a happy life, but that would be a pretty short and very different film. 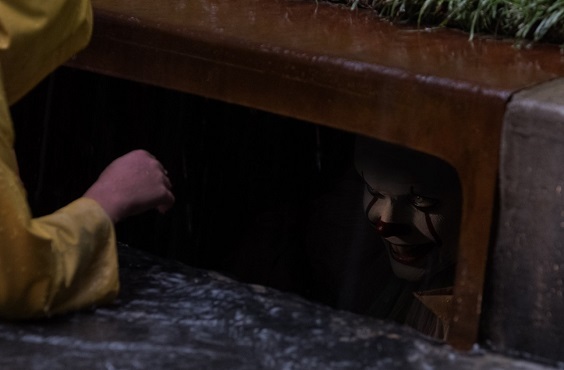 Of course, the star of the show is Pennywise, a stunning performance from Bill Skarsgard. Playing it with a mix of mischief and malevolence, his drooling, grinning, leering character is the most memorable screen villain since Heath Ledger’s Joker in 2008. There are so many jump scares in the movie, and plenty of laughs too, the tone is just right. A laugh here, a scream there. However, the format is also a little annoying. Every young character once they’re alone suffers visions and hallucinations, so there’s not much of a surprise when monsters jump out. Thankfully, it’s also very weird in places. Once the kids find the obligatory haunted house (art directed to within an inch of its life), the scene is set for a thrilling showdown. Secondary characters such as the inevitable young thugs who terrorise our heroes are also well cast. Whether coincidence or intentional, the lead villain has that air of the psycho Sid from Toy Story, while the shadow of other King adaptations looms large over the movie. The main influence is Stand By Me, and there are also nods to Carrie and The Shining, but without being the obvious Easter eggs displayed through The Dark Tower. Of course compressing 1100 plus pages into two plus hours of screen time means something is going to get jettisoned, and with the door left open for a sequel – or the rest of the actual novel – it means both fans of the source material and newcomers shouldn’t feel short changed.